Transparency Market Research (TMR) has published a new report titled ‘Foley Catheters Market - Global Industry Analysis, Size, Share, Growth, Trends, and Forecast, 2019–2027.’ According to the report, the global Foley catheters market was valued at approximately US$ 1.0 Bn in 2018. It is projected to expand at a CAGR of 5.8% during the forecast period from 2019 to 2027. The global market is anticipated to be driven by a rise in the population suffering from urinary disorders, rapid utilization of Foley catheters in hospitalized patients in developed regions, and increase in focus on new product launch by industry players. 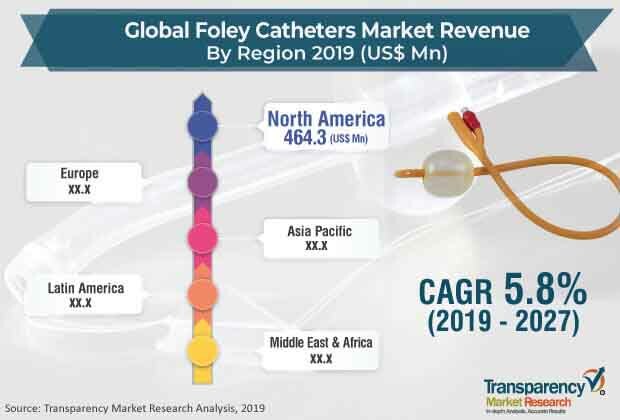 The Foley catheters market in Asia Pacific is expected to expand at a high CAGR of 6.6%, due to a rise in geriatric patient pool with urinary retention, thereby driving the demand for indwelling catheters in emerging countries such as India and China. Rise in the prevalence of urologic diseases, such as urinary retention, benign prostate hyperplasia (BPH), bladder obstruction, urinary incontinence, prostate cancer, and bladder cancers, is expected to fuel the demand for Foley catheters during the forecast period. Urinary retention is a chronic condition, wherein the patient is unable to voluntarily urinate and has an increased volume of residual urine in his bladder. It is most common urinary condition affecting the geriatric population, i.e., people of ages 40 and above. For instance, according to The American Academy of Family Physicians (AAFP), the overall incidence of urinary retention is 4.5 to 6.8 per 1,000 men, per year, in the U.S. Thus, an increase in number of target urinary diseases is expected to drive the demand for indwelling catheters, which in turn is likely to boost the market in the next few years. In terms of product, the market can be classified into 2 way, 3 way, and 4 way Foley catheters. The 2 way Foley catheters segment is projected to account for a leading share of the global market during the forecast period. 2 way Foley catheters are flexible indwelling catheters, appropriate for long-term use, which help drain urine from one lumen and have an inflatable balloon at the other end in order to hold the catheter in place. The segment is expected to expand at a considerable growth rate in the next few years, owing to an increase in the demand for these catheters for bladder drainage in patients with urinary retention. This is expected to boost their adoption rate in the next few years. Based on material, the global Foley catheters market has been bifurcated into latex and silicone. The silicone segment is expected to expand at a high CAGR during the forecast period, owing to advantages offered over conventional latex catheters. Longer life, large lumen diameter, inherent biocompatibility and bio-durability, decreased urethral irritation, and reduced encrustation offered by silicone catheters make them a preferred choice for urinary drainage for long-term usage. In terms of region, the global Foley catheters market has been segmented into North America, Europe, Asia Pacific, Latin America, and Middle East & Africa. North America is anticipated to account for a leading share of the global market during the forecast period, owing to an increase in utilization of Foley catheters in hospitalized patients in the U.S. Based on CDC, approximately 15% to 25% of hospitalized patients in the U.S. require indwelling catheters for proper bladder drainage, each year. Europe is anticipated to account for a significant share of the global market between 2019 and 2027, owing to the presence of well-established manufacturers with a broad product portfolio in the region. The market in Asia Pacific is likely to expand at a rapid pace in the next few years. Increase in number of baby boomers with urologic diseases requiring long-term care in countries such as India and China is expected to provide lucrative opportunities to the market in the near future. Moreover, an increase in focus of leading players on these emerging countries is another major factor propelling the Foley catheters market in Asia Pacific. For instance, in November 2017, Bactiguard entered into a partnership agreement with Neon Laboratories Limited, in order to launch its infection control BIP Foley catheter in India and consolidate its position in the market in the country. Key players profiled in this report include Teleflex Incorporated, Coloplast Corp., C.R. Bard (Becton, Dickinson & Company), Cook, B. Braun Melsungen AG, SunMed, Cardinal Health, Inc., Bactiguard, and Medline Industries. Companies operating in the global Foley catheters market focus on strategic acquisitions, collaborations, and partnerships to strengthen their position in the market.